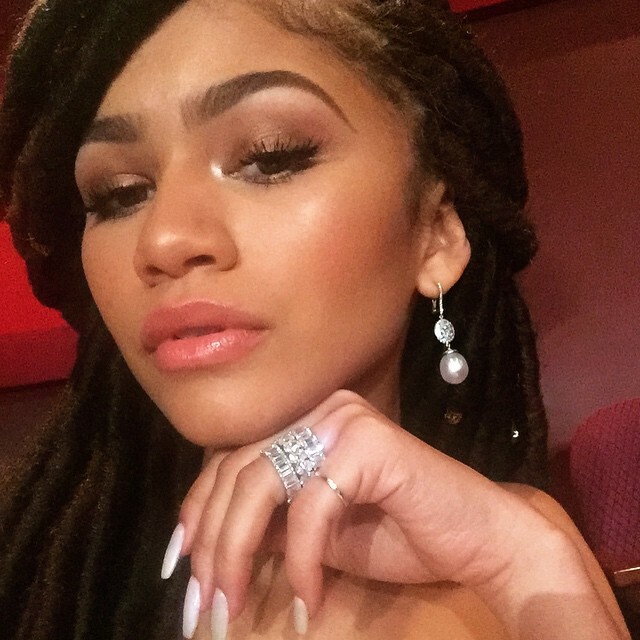 Zendaya has revealed the details for her new single. The actress-singer-songwriter christened “Something New” – featuring Chris Brown – as the first promotional cut from her upcoming second album. Production duties on “Something New” were handled by Leon Thomas and Khristopher Riddick-Tynes of The Rascals (Fleur East), Kenneth “Babyface” Edmonds (Madonna) and Antonio “Tony” Dixon (Justin Bieber). Zendaya’s sophomore studio collection is scheduled for release later this year through Universal Music Group / Republic Records. Other album contributors include Timbaland (Justin Timberlake), Diane Warren (Leona Lewis), RoccStar (Prince Royce), Talay Riley (Keri Hilson), Deputy (Rihanna), Taylor Parks (Meghan Trainor), and Jim Beanz (Craig David). Watch the music video for “Neverland” below. Singer/songwriter Meghan Trainor has recorded new material with Kenneth “Babyface” Edmonds, Antonio Dixon, Taylor Parks, and The Rascals. It is yet to be known whether the session was intended for another artist or a Trainor’s upcoming sophomore album. Kenneth “Babyface” Edmonds and Antonio Dixon have written and produced songs for Toni Braxton (“I Hate You”), Kristinia DeBarge (“Goodbye”), Beyonce (“Best Thing I Never Had”) and Alicia Keys (“That’s How I Knew”). Meanwhile, Taylor Parks is responsible for co-writing Fifth Harmony’s “Bo$$” [Syco Music], Keyshia Cole’s “Rick James” [Interscope], Jennifer Lopez’s “So Good” [Capitol] and Mariah Carey’s “Infinity” [Epic]. Finally, The Rascals – composed of members Leon Thomas and Khristopher Riddick-Tynes – have co-written and produced Ariana Grande’s “Honeymoon Avenue” [Republic] and Samantha Jade’s “Shake That” [Sony Music]. Meghan Trainor’s debut album “Title” – featuring hit singles including “All About That Bass,” “Lips Are Moving” and “Dear Future Husband” – is now available for download via iTunes in partnership with Epic Records. On the songwriting front, Trainor co-penned songs for Fifth Harmony (“Sledgehammer”), Sabrina Carpenter (“Can’t Blame a Girl for Trying”), Jason Derulo (“Painkiller”) and Racal Flatts (“I Like the Sound of That”). Samantha Jade has announced the details for her new single. “Always” was co-written by Carmen Reece, whose other credits include Ariana Grande’s “Almost is Never Enough” [Republic], Teyana Taylor’s “Put Your Love On” [Def Jam] and Jasmine V’s “That Me Right There” [Interscope]. Production duties were handled by Jon Levine, who is also responsible for Rachel Platten’s “Stand By You” [Columbia], Leona Lewis’ “Your Hallelujah” [Syco Music] and Fefe Dobson’s “Set Me Free” [Island]. Jade is scheduled to release her first studio collection “Nine” – featuring previous singles “Firestarter,” “Soldier,” “Sweet Talk” and “Shake That” – on November 20 through Sony Music Entertainment Australia. The highly-anticipated LP delivers further alliances with Babyface (Keri Hilson), Antonio Dixon (Beyonce), Ne-Yo (Rihanna), The Rascals (Fleur East), Mason “MDL” Levy (Justin Bieber) and The Fliptones (Jason Derulo). Watch the music video for “Shake That” below.